What Is It Like to Drive Through Italy? Before you begin working your way to foreign language fluency, it helps to understand the culture behind the language you’re learning. After all, language exists to help a group of people express their ideas and beliefs. Italy is an old country with a rich history and culture. As you begin your Italian language program, gaining a strong grasp on this history, the values, and the etiquette will help you rapidly achieve success. In particular, driving in Italy can be both a joy and a frustration for Italians people. Learn what to expect and avoid to get the most out of the experience. Italians may be fast and have a tendency to break rules; however, they tend to be incredibly conscious of safety and are usually very good drivers. Even though they are somewhat assertive while driving, Italians do not want to damage their cars. Despite that, they are known to speed in areas where being caught is unlikely. Ironically, it is over-courteous foreign motorists who sometimes cause accidents, as the general rule is “me first,” a concept that is difficult to grasp for those who have learned to drive based on rules. The speed limit in built-up areas is 50 kph (30 mph), while in rural areas it may be as high as 110 kph (68 mph). The latter is also the speed limit for dual highways and 90 kph (55 mph) is the limit on urban stretches. On expressways, 130 kph (81 mph) is the average speed limit. 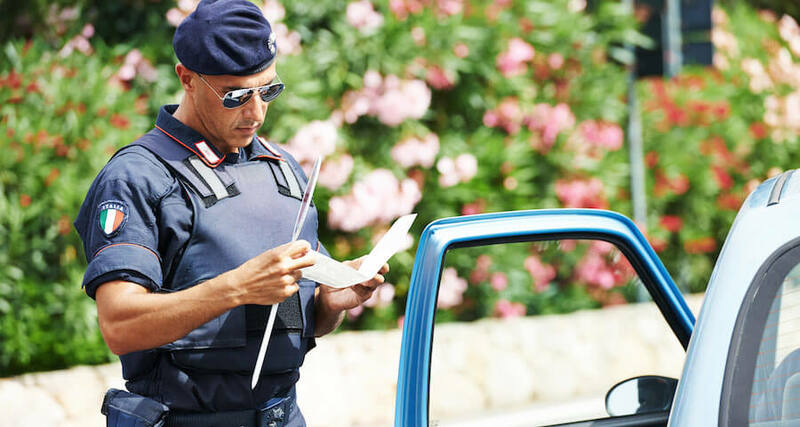 The police, or “carabinieri,”are allowed to give an instant fine for speeding or for not having your traffic documents within your vehicle. You can also receive a fine for not having the required breakdown equipment, such as a red warning triangle and a fluorescent life jacket. If you are in possession of a European Union driving license, it can be used in Italy for as long as you like. If you decide to become a resident of Italy, you can still use the EU license; however, it must be stamped by your local motor registry office or Automobile Club d’Italia. If your vehicle is larger than Class B, you must reapply for a license in Italy. If you are not an EU citizen, you can drive on your current driver’s license for up to a year, but you should have an Italian translation. To avoid taking a new driving test, you should apply for your license in Italy prior to getting a residence permit. Numerous international motorists opt to purchase an international driver’s license each year, rather than navigate the time-consuming process of obtaining an Italian license. You can acquire such a license at the town hall; however, you must remember to take the Italian translation of your license. This information must be placed on the appropriate forms, stamped in the magistrate’s court, and taken to the town hall with a passport-size photograph for authentication. A “certificato medico” is also necessary, which is a doctor-signed medical report. All these documents are taken to the USL, where an eye test is given. The paperwork and your current driver’s license then go to the “motorizazzione civile,” where you obtain a photocopy, “bollo,” and postal order. Five documents are necessary to obtain an Italian driver’s license. Fortunately, everything can be completed at your local Automobile Club d’Italia. In Italy, a motorist is required to drive on the right side of all roads and highways, and he or she must also yield to traffic coming from the left at all intersections and traffic circles. You should be aware of the fact that you are legally required to carry your motor vehicle registration and driver’s license–referred to as your road documents–in your car at all times. In addition, you must carry a warning triangle, spare warning lights, and a first aid package in your car whenever you are on the road. It is not uncommon to see traffic crossings ignored by other motorists; however, the police will give you an instant fine if a child between four and 12 years of age is not wearing a seat belt. A child safety seat is required for all youngsters under the age of four or you will likely be issued a fine on the spot. It is not uncommon for a motorist to plead ignorance of the law in an attempt to lower the amount of the fine. It may also be helpful for you to know that you do have a two-month grace period if you do not have the money to immediately pay a fine. To purchase a motor vehicle in Italy, you need to find your local fiscal code and be registered as a resident of the country. The transaction is not difficult to complete, provided you know the appropriate steps: initially, you and the person from whom you are purchasing the car must visit your local Automobile Club d’Italia–ACI–to conduct a “passaggio di proprietà.” This is the term for the transfer of ownership. The primary expenses associated with owning a motor vehicle in Italy are road taxes and insurance. In addition, you must also have a MOT referred to as a “revisione,” if the vehicle is more than three years old. Every two years thereafter, you must obtain a new MOT. The authorities receive a “bollino blu,” which is a document that states the vehicle has a clear history with no problems. If you plan to drive your own car in Italy, rather than purchasing a vehicle once you arrive, you have 12 months to do so before any issues arise. This is because foreigners can drive their own cars for up to a year in all areas of the European Union. The sole exception to this rule is a car with GB plates that is British registered. In this case, the vehicle can only be driven for six months. In many instances, it is less time consuming and cheaper to purchase a car in the local area where you will be spending time, as it can be complicated and expensive to import your own automobile. Estimates say that drivers in Italy spend approximately seven years of their life in a motor vehicle, and 24 months of that time is spent searching for a space to park. In cities, the best way to proceed is to find parking wherever you can and then use public transportation or simply travel on foot. Reclaiming your vehicle from a tow zone is costly, and these zones are marked by pictures, as well as the legends of “rimozione forzata” and “zona rimozione.” Take caution when parking in the street, particularly if it is scheduled for cleaning that night and your vehicle is an obstruction. Street cleaning occurs weekly, and the schedules are clearly posted. Avoid parking if you do not see other cars, as there may be a reason other drivers are avoiding that particular area. Lastly, a parked vehicle simply invites thieves, so do not leave anything visible in your car’s interior. Italy has over 6,000 km (3,700 miles) of expressways and the majority of them are toll roads. A white “A” on a green sign with a number marks the “autostrada.” You are given a ticket as you enter and make your payment when leaving. If you want to pay by card, a Telepass or Viacard can be acquired at expressway services and toll booths. The Italian Auto Club is referred to as the Auto Club d’Italia or ACI. They provide breakdown services that can be requested by dialing 116. Driving in Italy is not for the faint of heart. Traffic and speeds in Italy are notoriously heart-stopping because Italian drivers drive fast and aggressively. Within cities, parking is a challenge. Renting a car while in Italy is possible, but it is advisable to book before leaving home, so that you can compare rates and ensure everything will be included to avoid unseen add-on fees later. With high gas prices and narrow, ancient roads it is wise to rent the smallest car that will suffice. The cities tend to be very congested and have more available public transportation. To get the most out of a trip to Italy, a visitor who wants to drive should consider limiting the use of a car to time spent touring the countryside or traveling between metropolitan destinations. Throughout the country, there are many places cars are not allowed at all. Most cities have traffic-free zones in their historic centers. After departing the mainland by boat or water taxi to Venice, there are no cars on any of the islands that make up Venice, Burano, or Murano. Similarly, in the hills of Umbria and Tuscany, there are many towns and villages that still have their ancient walls, inside of which there are no cars. When driving in Italy, visitors need to be aware of the Italian propensity to jaywalk. Additionally, the use of motorcycles and mopeds in congested city streets is common. Local drivers may seem to flaunt many of the rules, speeding and racing traffic lights as they turn red. Italians love their cars; Italy has the second highest per capita rate of car ownership, after the United States.